South African trade union centre COSATU will appeal against a High Court ruling that the federation and its international secretary Bongani Masuku are guilty of anti-Semitism and hate speech, it has confirmed. The ruling was handed down by Judge Seun Moshidi on June 29 at the South Gauteng High Court in Johannesburg. COSATU noted “the proud record of heroic Jews in our ranks who selflessly fought against apartheid,” including Joe Slovo, who served as chief of staff of liberation movement armed wing uMKhonto we Sizwe, and Dennis Goldberg, who was convicted at the Rivonia trial with Nelson Mandela and others and sentenced to life imprisonment. When Israel launched its war on Gaza in 2009, which slaughtered over 1,400 Palestinians, including 300 children, COSATU led many protests against those barbaric attacks, standing alongside wide sections of civil society, including progressive members of South Africa’s Jewish community. Durban dockers, members of COSATU-affiliated transport union Satawu, refused to unload cargo from an Israeli ship. 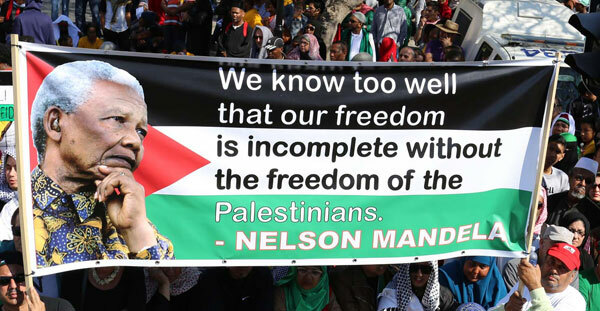 The federation was subject to sustained attacks by the South African Zionist Federation and the South African Jewish Board of Deputies, which were vocal supporters of the Israeli assault on Gaza. The African National Congress decided at its policy conference in Johannesburg last week to push for demotion of the South African embassy in Israel to liaison office status in protest at the country’s obstruction of Palestinian national rights.